UNSUNG is a colossal repository of rock‘n’roll writing — a Gnostic Odyssey through lost and forgotten freakouts. Check out Cope’s decade-long Album of the Month; wade through the psychedelically enhanced hard rock visions of the Book of Seth; then take the opportunity to deliver your own worldview of rock‘n’roll free from editorial constraints, Motherfuckers! 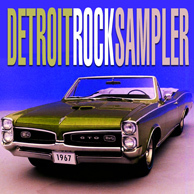 Continuing in that same blistering vein as the others in Cope's SAMPLER series, DETROITROCKSAMPLER offers listeners 38 classic sonic slabs from the period 1966-76, the main text also exploring the peculiar social and political reasons why this North American city's music was, compared to other contemporary cultural centres, so deeply and riotously intense.